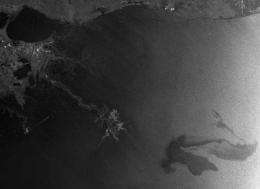 These ESA Envisat images capture the oil that is spilling into the Gulf of Mexico after a drilling rig exploded and sank off the coasts of Louisiana and Mississippi, USA, on 22 April. In the black-and-white radar image the oil spill is visible as a dark grey whirl in the bottom right, while in the optical image it is seen as a white whirl. 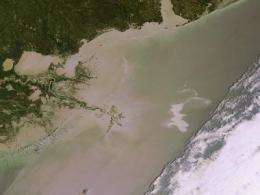 The Mississippi Delta is at top left, and the Delta National Wildlife Refuge extends out into the Gulf. Officials report that about 1000 barrels of oil a day is escaping from a damaged oil well located 1.5 km under the drilling rig. By yesterday afternoon, the spill was covering an area some 77 km long and 63 km wide. The US Coast Guard, the National Oceanic and Atmospheric Administration, the London-based BP and oil industry experts are attempting to stem the leak and prevent it reaching the Gulf Coast and the fragile ecosystem there. In order to observe the clean-up efforts, the US Geological Survey, on behalf of the US Coast Guard, requested satellite maps of the area from the International Charter Space and Major Disasters. The Charter is an international collaboration, initiated by ESA and the French space agency, CNES, to put satellite remote sensing at the service of civil protection agencies and others in response to natural and man-made disasters. Envisat acquired these images from its Advanced Synthetic Aperture Radar (black and white) and Medium Resolution Imaging Spectrometer on 26 April at 15:58 UTC and on 25 April at 16:28 UTC, respectively.